We offer a wide range of children’s dental services to promote a lifetime of oral health for your children. Call us today to learn more about our Pediatric Dental Procedures. Our office, as well as the American Academy of Pediatric Dentistry, recommends that your child visit the dentist by his/her 1st birthday. 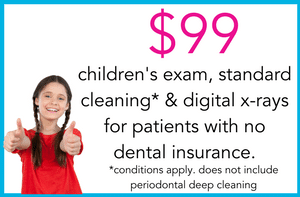 Regular cleanings are critical to your child’s overall oral health. We perform regular check-ups, cleanings and oral health evaluations in our Smyrna / Vinings children’s dental office. Minimal sedation is a safe and effective technique used to relax and reduce anxiety during dental procedures. Children are drowsy but still conscious and responsive to verbal commands. Minimal sedation is indicated for children who experience higher levels of anxiety. In addition, sedation is also recommended for children who are very young or who have special needs and are unable to cooperate for dental treatment. Dental x-rays or radiographs are very important. We use digital x-rays, which use 90% less radiation than traditional x-rays, to provide an instantaneous image to quickly diagnose hidden problems that are not evident otherwise. We also utilize “panoramic” x-rays, which provide a full view of the oral cavity to examine your child’s overall development. We utilize more esthetic, tooth-like materials (composite resin) that are safe, predictable and will bond to tooth structure. They look and react more like natural teeth. Fluoride is safe and effective in reducing the risk of cavities and reversing enamel demineralization (first step in cavity formation). Placing dental sealants is a safe and effective procedure that aids in preventing pit and groove cavities on certain high-risk teeth. They are a tooth colored resin material that are “painted” onto the tooth surface and bonded to the enamel. Sealants are not permanent, but will be checked regularly. Remember, sealants DO NOT help in preventing cavities in between teeth, therefore, flossing is still necessary. We use tooth-colored fillings to make your child’s smile look as natural as possible. If your child’s tooth is severely damaged, it may require a dental crown. We use the finest, most durable dental crown materials, made in America.